February: the month of love, and fantastic specials. Whether you want to treat your partner to a special evening, plan an epic first date, or just take advantage of some sweet Valentine’s Day specials, there’s plenty to choose from. Here’s our pick of things to do on Valentine’s Day in Cape Town. 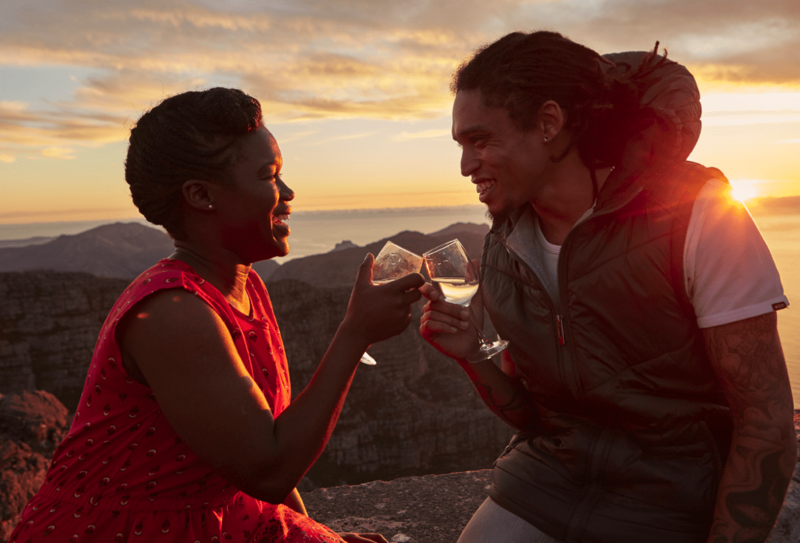 Surprise your Valentine with the ultimate romantic experience in Cape Town – taking in a spectacular sunset for half the price at the summit of Table Mountain. This awe-inspiring and romantic deal is available to South Africans with valid IDs only. Got your eye on someone special? Treat them to a dose of romance with Shakespeare’s Romeo & Juliet Valentine’s day screening at the breathtakingly beautiful Nooitgedacht Wine Estate. You’ll also be treated to a live music performance by Ezra Lingeveldt before the start of the movie. 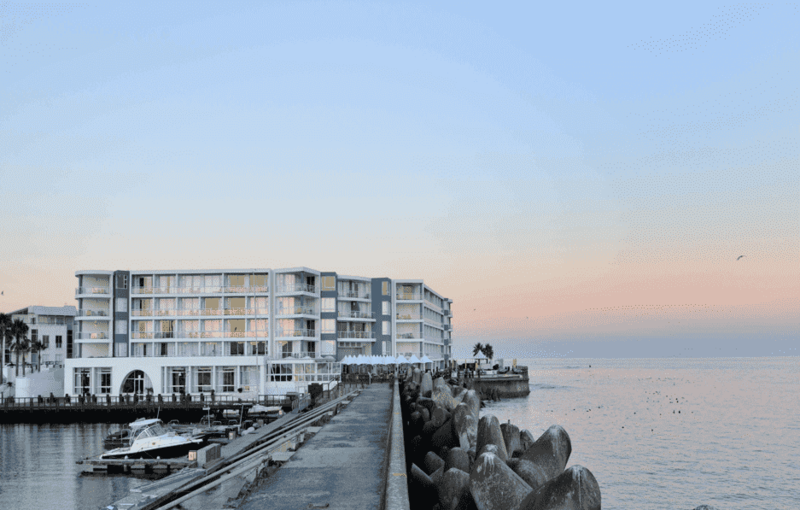 Celebrate Valentine’s day this year with the most romantic setting at Radisson Blu Hotel Waterfront where you will get the best views in Cape Town for you and your loved one on this special occasion. There is a picnic option which will take place on the lawn. If you are interested in a more formal option the Radisson Blu Hotel has you covered with a five course sit-down dinner and a welcome cocktail. Cape Town Comedy Club presents their annual Anti-Valentine’s Day Comedy Show. Local comedians will help you forget about the gooey romance all around you. Bring your friends along for a night of laughter, with Carl Weber as the MC, Dustin Moore as the Headline Act, supported by Tsitsi & open mic act Keith Mukhram. The Internationally acclaimed Bryan Ferry is one of the most innovative and stylish musicians, songwriters and singers to emerge in pop and rock music. This Valentine’s Day, he is coming to Cape Town in 2019 as part of his Global Tour. He will be performing live at Grand Arena, GrandWest. Be sure to enjoy a live performance concert on Valentine’s Day and celebrate this special occasion with loved ones. 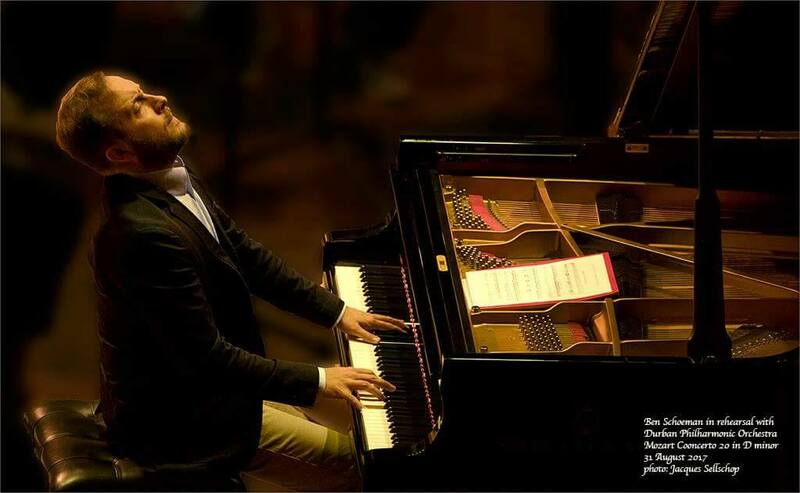 Catch the winner of the 11th UNISA Vodacom International Piano Competition live at City Hall this Valentine’s Day. Ben Schoeman will play the Brahms Piano Concerto no 1 in D minor with the Cape Town Philharmonic Orchestra in the final concert of the Summer Music Festival. Bring along friends and family or that special someone to share this occasion with on Valentine’s Day. For those who want to get their blood pumping this Valentine’s Day, enjoy a 5km fun run/walk at Devonvale Golf and Wine Estate. Expect live entertainment, as well as food stalls, a cocktail bar, wine bar, and beer from the Stellenbosch Brewing Company. Come and enjoy Valentine’s Day with The President Hotel’s ever-popular silent open-air movie night. Enjoy a romantic evening surrounded by breathtaking sea views. Guests can enjoy a glass of bubbly on arrival, charcuterie antipasto board with a selection of locally sourced cheeses, delicious cold meats, and plenty of veggie accompaniments, as well as popcorn to enjoy during the movie. Join the 41 Restaurant with their amazing views of the Camps Bay Beach. There will be great food as well as live music to enjoy with your beloved. Chef Aristotle will be dishing up a delectable a la carte menu to choose from. To top off the night and make it even more memorable, bubbly will be half price for the whole night. Spoil your loved one this Valentine’s Day with a complimentary glass of bubbles and a three-course lunch or dinner. Not only will you get to enjoy the feast: you’ll also stand a chance to win a night for two at the Southern Sun Cullinan. 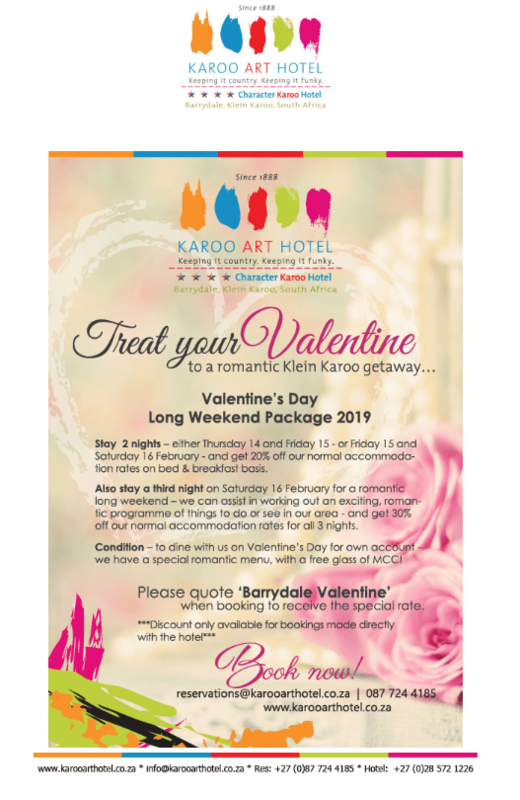 Treat your valentine’s to a romantic Klein Karoo Getaway – A Valentine’s Day Long Weekend Package. Stay 2 nights either the 14-15 February or the 15 -1 6 February and get 20% off normal accommodation rates on bed & breakfast basis. Also stay the third night on the Saturday 16 February for a romantic long weekend – we can assist in working out an exciting romantic programme of things to see and do in the area. get 30% off our normal accommodation rates for all 3 nights. 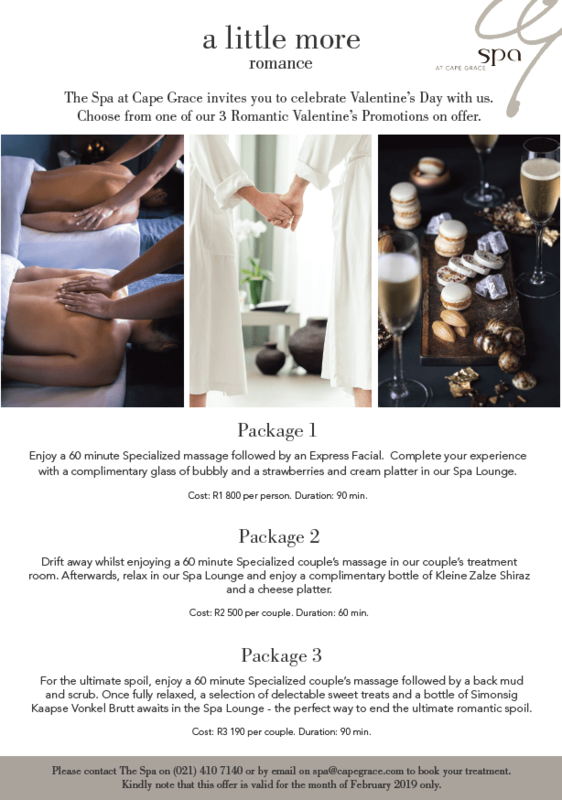 The Spa at Cape Grace invites you to celebrate Valentine’s Day with them. Choose from one of their 3 Romantic Valentine’s Day Promotions on offer. 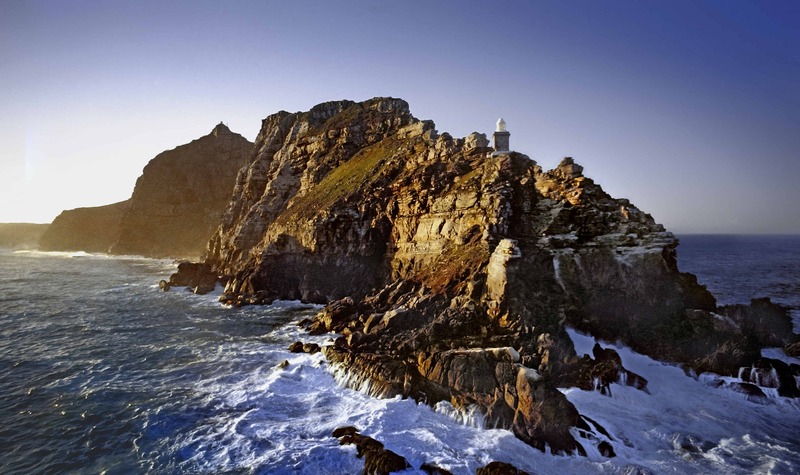 It may not be the southernmost point of Africa – that honour goes to Cape Agulhas – but Cape Point certainly makes you feel as if you are standing at the edge of the world.